TLJ Daily E-Mail Alert No. 2,348, March 7, 2012. March 7, 2012, Alert No. 2,348. 3/8. The Senate amended and approved by voice vote S 1886 [LOC | WW], the "Counterfeit Drug Penalty Enhancement Act". Sen. Patrick Leahy (D-VT), the Chairman of the Senate Judiciary Committee (SJC), and sponsor of the bill, addressed the problem of online drug sales, advocated passage of the PROTECT IP Act, and criticized Google. S 1886 is a simple bill would merely amend 18 U.S.C. § 2320(b) to increase penalties for trafficking of counterfeit drugs. It would increase the maximum penalties for individuals to $4 Million fines, and 20 years in prison. For corporations, the maximum fine would be raised to $10 Million. Currently, the statute imposes the same maximum penalties for trafficking in counterfeit drugs and trafficking in counterfeit clothes and fashion accessories. Sen. Leahy related statistics on deaths resulting from counterfeit drug sales. Sen. Leahy (at right) spoke about the bill in the Senate on November 17, 2011, when he introduced the bill, in the Senate on March 7 when the Senate passed the bill, and again at the SJC executive business meeting on March 8. He stated on March 8 that counterfeit drugs are currently available on "our major web sites, Google, others". He added that "you can just go on there and buy these kind of counterfeit drugs". On November 17 he stated in the Senate that "Combating the sale of counterfeit drugs is increasingly difficult", in part because of the "prevalence of Internet pharmacies". See, Congressional Record, November 17, 2011, at Page S7705. This bill would not amend current law to reference online auction sites, search providers, advertising providers, or financial intermediaries. The Department of Justice (DOJ) fined Google $500 Million last year for providing advertising assistance to foreign online pharmacies that illegally sell drugs to U.S. consumers. See, story titled "Google to Pay $500 Million for Allowing Its AdWords Program to be Used to Promote Illegal Online Drug Sales" in TLJ Daily E-Mail Alert No. 2,292, August 24, 2011. Sen. Leahy stated in the Senate on March 7 that "This is important legislation to deter the influx of counterfeit medication. The bill will not only support the American economy and job creation by protecting American intellectual property, but it will protect the health and safety of American consumers." He added that "We cannot allow the counterfeiting of life-saving medicine to be just one more low-risk venture from which international organized criminals can profit." 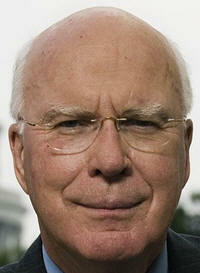 Sen. Leahy had more blunt words for Google and other companies at the March 8 Committee meeting. He said that "we have taken steps to advance legislation to prevent the online sale of counterfeit drugs with the PROTECT IP Act." "Unfortunately, some of the same large companies that through their businesses make money out of selling these drugs that end up killing Americans, were among those who tried to block, and did block, at least temporarily, the PROTECT IP Act. I hope that maybe people will start thinking about what is best for the American people, and not just what is best for their bottom line", said Sen. Leahy. This bill is S 968 [LOC | WW], the "Preventing Real Online Threats to Economic Creativity and Theft of Intellectual Property Act of 2011", "PROTECT IP Act", or "PIPA". See also, story titled "Sen. Reid Postpones Senate Consideration of PROTECT IP Act" in TLJ Daily E-Mail Alert No. 2,332, January 19, 2012. 2/28. Sen. Olympia Snowe (R-ME) announced that she will not run for re-election in November. She is a senior member of the Senate Commerce Committee (SCC), which has jurisdiction over telecommunications and other technology related issues. Sen. Kay Hutchison (R-TX), the ranking Republican on the SCC, announced a year ago that she will not run for re-election. Other SCC members face tough election contests. The Senate Judiciary Committee (SJC) also has many members who are either retiring or facing difficult elections. The members of the SCC who are running for re-election in November include Sen. Maria Cantwell (D-WA), Sen. Bill Nelson (D-FL), Sen. Amy Klobuchar (D-MN), Sen. Claire McCaskill (D-MO), and Sen. Roger Wicker (R-MS). Rep. Todd Akin (R-MO) is among those seeking McCaskill's seat. Rep. Connie Mack (R-FL) is among those seeking Sen. Nelson's seat. Sen. Jim DeMint (R-SC) is next in seniority among SCC Republicans, after Sen. Hutchison and Sen. Snowe. He therefore would likely become SCC Chairman if the Republicans were to win a majority in the Senate in this year's elections. In telecommunications, Sen. DeMint (at right) is an advocate of preventing the Federal Communications Commission (FCC) from imposing network neutrality mandates on broadband internet access service providers. See, S 3624 [LOC | WW], the "Freedom For Consumer Choice Act" or "FCC Act", in the 111th Congress, and story titled "Senate Republicans Introduce Bill to Constrain FCC by Antitrust Principles" in TLJ Daily E-Mail Alert No. 2,111, July 26, 2010. See also, S 2113 (109th Congress), the "Digital Age Communications Act of 2005" or "DACA", also sponsored by Sen. DeMint. There will also be turnover on the Senate Judiciary Committee (SJC), which has jurisdiction over patent, copyright, antitrust, cybercrime, electronic surveillance, and other technology related issues. Sen. Jon Kyl (R-AZ) and Sen. Herb Kohl (D-WI), both senior members SJC, have announced that they will not run for re-election. Sen. Klobuchar, who is a member of both the SCC and SJC, is up for re-election, as are Sen. Sheldon Whitehouse (D-RI), Sen. Ben Cardin (D-MD), Sen. Dianne Feinstein (D-CA), and Sen. Orrin Hatch (R-UT). 2/27. Tony West was named acting Associate Attorney General at the Department of Justice (DOJ). In addition, Stuart Delery was named acting Assistant Attorney General in charge of the DOJ's Civil Division. See, DOJ release. West (at right), who will replace Tom Perrelli, joined the Obama administration in early 2009 as Assistant AG of the Civil Division. Before that, he was a partner in the San Francisco office of the law firm of Morrison & Foerster. See also, story titled "Obama Names Perrelli to be DOJ Associate Attorney General" in TLJ Daily E-Mail Alert No. 1,878, January 6, 2009. The Associate AG is the third ranked position at the DOJ, after the Attorney General and the Deputy Attorney General. This position oversees the key civil components of the DOJ, including the Antitrust Division, Civil Division, and Civil Rights Division. Delery, who will replace West, has worked in various positions in the Obama DOJ since early 2009. Before that, he was a partner in the Washington DC office of the law firm of Wilmer Hale. 3/8. The Senate Judiciary Committee (SJC) held an executive business meeting at which it approved the nomination of Patty Shwartz to be Judge of the U.S. Court of Appeals for the 3rd Circuit by a vote of 10 to 6. Sen. Charles Grassley (R-IA), the ranking Republican on the SJC, opposed her nomination. He stated that her "response to questions submitted for the record contradicted her hearing testimony". He also referenced "her unresponsive answers, her misapplication of law, and lack of appellate experience", and President Obama's "so called recess appointments". Democrats voted yes. Sen. Grassley, Sen. Orrin Hatch (R-UT), Sen. Jeff Sessions (R-AL), Sen. Lindsay Graham (R-SC), Sen. John Cornyn (R-TX), and Sen. Tom Coburn (R-OK) voted no. Sen. Jon Kyl (R-AZ) voted present. 3/8. The Senate Judiciary Committee (SJC) held an executive business meeting at which it approved the nomination of Jeffrey Helmick to be a Judge of the U.S. District Court for the Northern District of Ohio by a vote of 11 to 6. 3/8. The Senate Judiciary Committee (SJC) held an executive business meeting at which it approved the nomination of Mary Lewis to be a Judge of the U.S. District Court for the District of South Carolina by a vote of 11 to 6. 3/8. The Senate Judiciary Committee (SJC) held an executive business meeting at which it approved the nomination of Timothy Hillman to be Judge of the U.S. District Court for the District of Massachusetts by a vote of 17 to 1. 3/6. The Senate confirmed Mary Phillips to be a Judge of the U.S. District Court for the Western District of Missouri by a vote of 95 to 2. See, Roll Call No. 26. 3/6. The Senate confirmed Thomas Rice to be a Judge of the U.S. District Court for the Eastern District of Washington by a vote of 93 to 4. See, Roll Call No. 27. 2/29. President Obama nominated Brian Davis to be a Judge of the U.S. District Court for the Middle District of Florida. See, White House news office release and release. He has been a state court judge in Florida since 1994. 2/29. President Obama nominated John Dowdell to be a Judge of the U.S. District Court for the Northern District of Oklahoma. See, White House news office release. He is a partner in the Tulsa, Oklahoma law firm of Norman Wohlgemuth Chandler & Dowdell. His law firm biography states that he handles complex litigation, including antitrust and telecommunications, and that his clients include T-Mobile USA and Gemstar-TV Guide. 2/27. The Senate confirmed Margo Brodie to be a Judge of the U.S. District Court for the Eastern District of New York by a vote of 86 to 2. See, Roll Call No. 23. The House will meet at 10:00 AM for morning hour, and at 12:00 NOON for legislative business. See, Rep. Cantor's schedule for the week. The House will continue its consideration of HR 3606 [LOC | WW], the "Reopening American Capital Markets to Emerging Growth Companies Act of 2011". See, story titled "House Financial Services Committee to Mark Up Bill to Provide Regulatory Relief to Emerging Growth Companies" in TLJ Daily E-Mail Alert No. 2,336, February 14, 2012. The Senate will meet at 9:30 AM. It will resume consideration of S 1813 [LOC | WW], the surface transportation bill. 9:00 AM. The House Intelligence Committee (HCC) will hold a brief open event titled "Committee Views and Estimates on the President's Budget for Fiscal Year 2013". See, notice. Location: Room HVC-304, Capitol Visitor Center. 9:15 AM. The House Intelligence Committee (HCC) will hold a closed hearing titled "Ongoing Intelligence Activities". See, notice. Location: Room HVC-304, Capitol Visitor Center. 9:00 - 10:30 AM. The Information Technology and Innovation Foundation (ITIF) and the Kaufman Foundation will host an event to release a report titled "The Global Innovation Policy Index". The speakers will be Robert Atkinson (ITIF), Philip Auerswald (Kaufman Foundation), Thomas Kalil (EOP's OSTP), Eric Miller (Industry Canada), and Steven Stewart (IBM). See, notice. Location: ITIF/ITIC: Suite 610, 1101 K St., NW. 10:00 AM. The Senate Appropriations Committee (SAC) will hold a hearing on the FY 2013 budget for the Department of Justice (DOJ). The witness will be Attorney General Eric Holder. See, notice. Location: Room 124, Dirksen Building. 10:00 AM - 12:00 NOON. The House Science Committee's (HSC) Subcommittee on Research and Science Education will hold a hearing titled "NSF Major Research Equipment and Facilities Management". The HSC will webcast this event. Location: Room 2318, Rayburn Building. 10:00 AM. The Senate Judiciary Committee (SJC) will hold an executive business meeting. The agenda includes consideration of Patty Shwartz (to be a Judge of the U.S. Court of Appeals for the 3rd Circuit), Jeffrey Helmick (USDC/NDOhio), Mary Lewis (USDC/DSCar), and Timothy Hillman (USDC/DMass). The SJC will webcast this event. See, notice. Location: Room 226, Dirksen Building. The House will meet at 11:00 AM. Deadline to submit reply comments to the Federal Communications Commission (FCC) in response to its Public Notice (PN) [21 pages in PDF] regarding Auction 901, which will auction high cost universal service subsidies through reverse competitive bidding. It is also titled "Mobility Fund Phase I Auction". The FCC released this PN on February 2, 2012. It is DA 12-121 in AU Docket No. 12-25. See also, notice in the Federal Register, Vol. 77, No. 28, Friday, February 10, 2012, at Pages 7152-7162. The House will not meet the week of Monday, March 12, through Friday, March 16, except for pro forma sessions on March 13 and 16. The Senate will meet at 2:00 PM. It will resume consideration of S 1813 [LOC | WW], the surface transportation bill. 10:30 AM. The Senate Judiciary Committee (SJC) will hold a hearing titled "The Freedom of Information Act: Safeguarding Critical Infrastructure Information and the Public’s Right to Know". The witnesses will be Melanie Pustay (Director of the DOJ's Office of Information Policy), Miriam Nisbet (Director of the NARA's Office of Government Information Services), Kenneth Bunting (Missouri School of Journalism), Jerry Ensminger, and Paul Rosenzweig (Heritage Foundation). The SJC will webcast this event. See, notice. Location: Room 226, Dirksen Building. Deadline to submit reply comments to the Federal Communications Commission (FCC) in response the FCC's Public Notice (PN) regarding LightSquared's Petition for Declaratory Ruling. The FCC released this PN on January 27, 2012. See also, correction to this PN, also released on January 27. This PN is DA 12-103 in IB Docket No. 11-109 and ET Docket No. 10-142. 12:00 NOON - 2:00 PM. The Federalist Society will host a panel discussion titled "Antitrust Enforcement as Regulation". The speakers will be Ronald Cass, James Miller (Husch Blackwell), Rick Rule (Cadwalader Wickersham & Taft), and Robert Skitol (Drinker Biddle & Reath). See, notice and registration page. Lunch will be served. Free. The Federalist Society will telecast this event. The dial in number is 800-616-4021; there is no pass code. For more information, contact Hannah De Guzman at 202-822-8138 or hannah dot deguzman at fed-soc dot org. Location: National Press Club, Holeman Lounge, 13th Floor, 529 14th St. NW. 12:30 - 2:00 PM. The American Enterprise Institute (AEI) will host a panel discussion titled "Inventing the Future: What’s Next for Patent Reform?". The speakers will be Michael Abramowicz (George Washington University School of Law), James Delong (Convergence Law Institute), Paul Michel (former Judge of the U.S. Court of Appeals for the Federal Circuit), Alex Tararrok (George Mason University), and Nick Schultz (AEI). Lunch will be served. See, notice. The AEI will webcast this event. Location: AEI, 12th floor, 1150 17th St., NW. 12:30 - 2:00 PM. The DC Bar Association's Media Law Committee will host a closed brown bag lunch meeting to discuss media and communications law developments. Free. No CLE credits. Reporters are barred from covering this event. events. For more information, contact the DC Bar at 202-626-3463 or Kurt Wimmer (Covington & Burling) at kwimmer at cov dot com or Jim McLaughlin at mclaughlinj at washpost dot com. See, notice. Location: Covington & Burling, 1201 Pennsylvania Ave., NW. 2:30 - 4:30 PM. The Senate Banking Committee's (SBC) Subcommittee on Financial Institutions and Consumer Protection will hold a hearing titled "Examining Issues in the Prepaid Card Market". The witnesses will be Lauren Saunders (National Consumer Law Center) and David Rothstein (Policy Matters Ohio). See, notice. Location: Room 538, Dirksen Building. 2:45 PM. The Senate Judiciary Committee (SJC) will hold a hearing on judicial nominations: William Kayatta (to be a Judge of the U.S. Court of Appeals for the 1st Circuit), John Fowlkes (USDC/WDTenn), Kevin McNulty (USDC/DNJ), Michael Shipp (USDC/DNJ), and Stephanie Rose (USDC/SDIowa). See, notice. The SJC will webcast this event. Location: Room 226, Dirksen Building. 9:00 - 10:30 AM. The Information Technology and Innovation Foundation (ITIF) will host a panel discussion titled "Boosting Exports, Jobs, and Economic Growth by Expanding the Information Technology Agreement". The Ministerial Declaration on Trade in Information Technology Products (ITA) was concluded at the World Trade Organization (WTO) Singapore Ministerial Conference in December of 1996. This 15 year old ITA does not cover GPS devices, e-readers, flat panel TVs, and other tech products. The speakers at this event will be Miriam Sapiro (Deputy US Trade Representative), Charlene Barshefsky (Wilmer Hale), Susan Schwab (University of Maryland), Greg Slater (Intel), Stephen Ezell (ITIF), and Robert Atkinson (ITIF). See, ITIF notice. See also, the WTO's ITA web page. Location: ITIF/ITIC: Suite 610, 1101 K St., NW. 10:00 AM. The Senate Finance Committee (SFC) will hold a hearing titled "Russia's WTO Accession -- Implications for the United States". The witnesses will be Samuel Allen (Ch/CEO of Deere & Company), Ronald Pollett (P/CEO of GE Russia/CIS), Watty Taylor (Montana Stockgrowers Association), Paul Williams (ASCAP), Alan Larson (Transparency International USA). See, notice. Location: Room 215, Dirksen Building. 1:00 - 2:30 PM. The American Bar Association (ABA) will host a webcast event titled "Social Media, Data Privacy, Online Gambling, and Other Hot Topics in Advertising & Promotions". The speakers will be Scott Dailard (Dow Lohnes), Steven Baron (Mandell Menkes), Brendan Healey (Tribune Company), Jill Meyer (Frost Brown Todd), and Andrea Shandell (Gannett Co.). CLE credits. Prices vary. See, notice. 6:00 - 8:15 PM. The Federal Communications Bar Association (FCBA) an event titled "Developments in the Effort to Improve Broadband Adoption". CLE credits. Prices vary. Registrations and cancellations are due by 5:00 PM on March 13. Location: Arnold & Porter, 555 12th St., NW. Deadline to submit comments to the National Institute of Standards and Technology's (NIST) Computer Security Division (CSD) regarding its draft SP 800-61 Rev. 2 [63 pages in PDF], titled "Computer Security Incident Handling Guide".